Introductions, explanation of formation of working group between Mandison, Gallatin, Park, Sweetgrass, Stillwater and Carbon counties, hoping to add Bighorn. Mission is to assist forest service in getting boots on the ground, and projects accomplished, maintain, preserve and restore forest health. Stated it was their 5th meeting. They dont want to sit around for 2 years talking about projects, they want to get projects on the ground. Effective collaborative that sets goals and meets those goals - members of collaborative to help meet those goals. Round Table (counter clockwise) explaining what the participants are hoping to see. I was concerned by Nylunds statement, so I have transcribed most of it for you. The reason there is so much litigation is because MEPA and NEPA are not being followed, but bypassed. Land management needs to be based on a number of things, most especially the science, not just special interests of a group of people. 31:30 - Erik Nylund, "Senator Tester is a big fan of collaboratives. The best ideas are going to come from the ground in Montana, they are not going to come from Washington DC with mandates and things like that. That's where a lot of things with FS or any other agency for that matter, go awry. We have some very well functioning collaboratives in Montana that have done some great things...You guys can really do a lot here, bring some people in, hopefully avoid some of the litigation. I think you said it best, put your collective weight behind it, those are the sort of things that a federal judge is going to notice when you guys come to an agreement, FS part of it, pretty diverse crowd, and one or two people sitting on the other side of the courtroom. That's the future of land management. And the tourism issue, 6 billion dollars alone, Montana's economy, public lands generate. That's not counting the grazing, the timber, the mining. These public lands are defintely some of our most important treasures. So your work here is very important work for the whole states economy." Earl Atwood spoke to more clear identification of issues, organization to assist FS, stave off landmines of the past; Sidney Fitzpatrick addressed the Native American perspective and contribution, a liaison between BIA and tribes; Jim Hart expressed concern by multi use, Big Sky economic driver, recreational, safety, cant have fire, find specific spots and move it fast; Richard Stem discussed multiple use, smart use, dealt with NEPA and litigation; John Prinkki wanted good representation. They asked what I was there for, I explained I was a conservation hunter, a member of the public, dealt with Public Trust issues, scientific wildlife management that was the focus of EMWH. Prinkki asked if I would be interested in participating. Prinkki explained interest in multi stakeholder participation, stated that working with Bree Dugan from Sen. Walsh's office they came up with a good list of participants, most of which had been invited. They want the working group to have good standing, good forest managment practices, healthy forest. Break, then a discussion of stakeholders, the issues such as watershed, road issues. Prinkki spoke to the long term aspect of the collaborative, self sustaining, that forest management would be ongoing, longeivity of the group depends on small issue, success, then go forward. 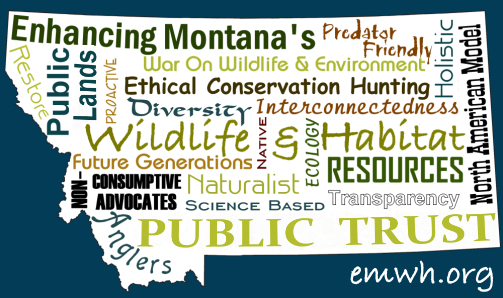 Next meeting was tentatively set for Sept. 10th, in Bozeman, same location.